Explore your imaginative side with this 35-piece castle-themed block set. 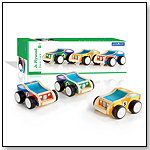 Includes wooden knights , horses and a variety of colored and non – colored blocks. Made of PlanWood, a sustainable material created from recycled sawdust. The Playground set is composed of three units with four different functions. There are 2 function-swing and slider in one unit, a seesaw, a sandbox, and a bucket. Children will enjoy reconstructing and creating their own imaginary playground. Make a seed blossom into a beautiful flower. 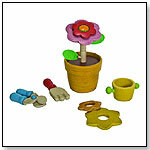 This set includes all the tools kids need to build a flower: seed, soil, watering can, shovel, garden shears, stackable stems, 2 leaves, and 4 interchangeable flower petals. Launch date: August 2012. 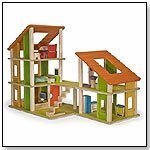 This dollhouse features a balcony, sliding doors, and space to create four roooms. Made of eco-friendly PlanWood and solid rubber wood. Launch date: August 2012. Two complete place settings for pretend meals. Includes 2 plates, 2 bowls, 2 cups, 2 sets of utensils. Made of sustainable PlanWood, a durable new material made from the sawdust leftover from rubberwood products. Plan Toy Sort and Count stacking toy can move preschoolers to the next level of basic math skills through play. 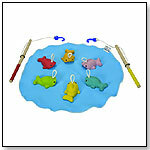 It is designed to challenge children's sorting and counting skills. 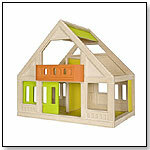 The natural wood frame has collapsible rods for safety and the large bead-like rings fit nicely into small hands. Kids sort the beads by color, counting as they stack the beads. Children will make basic math discoveries as they experiment and see that two yellow beads and one blue bead goes as high as three green beads.